What is a Football Marathon? This week, we’re back at the Horn of Africa Development Initiative in Marsabit, Kenya, holding our second training course under the Positive Action for Girls and Women programme. It was great for facilitator Laura Brooks to be reunited with the HODI football coaches, some of whom had travelled from as far as Moyale, near the Ethiopian border, to attend. As well as learning our interactive football drills, every TackleAfrica training course also has classroom sessions on HIV or Sexual and Reproductive Health and Rights, ensuring our coaches have all the knowledge they require to deliver information to their communities. But with most things, the best way to truly learn is to put the theory into practice. 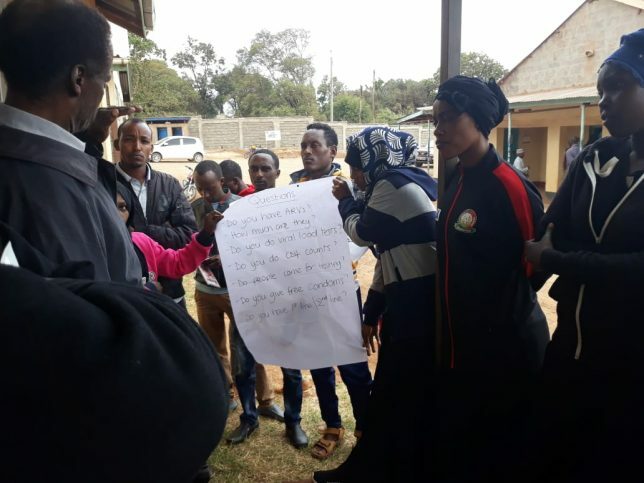 After workshops looking at HIV Testing and Counselling and Antiretroviral Therapy (ART) (the drugs used to treat and reduce the effects of HIV) the entire group of coaches paid a visit to the local Marsabit County Hospital, to see what services were available and how they’re delivered. After learning about self-test HIV kits in the classroom, the coaches got to see one for themselves and watch the facilitator demonstrate the mouth swab test. At the hospital, they were greeted by the HIV Coordinator for the region, Mr Guyo, who gave an hour of his time to show us each hospital department involved in the prevention and treatment of HIV. The coaches got to see close up how the HIV testing procedures work, where the ART drugs are kept and prescribed, and how pregnant women are given free antenatal care. The coaches also got a chance to ask Mr Guyo their own questions, such as does the hospital do CD4 counts and viral load testing and whether second line treatment ART was available. Mr Guyo was impressed to find a group of young educators keen to find out the reality of the HIV situation in Marsabit and as the coaches left he implored them to keep educating the youth. 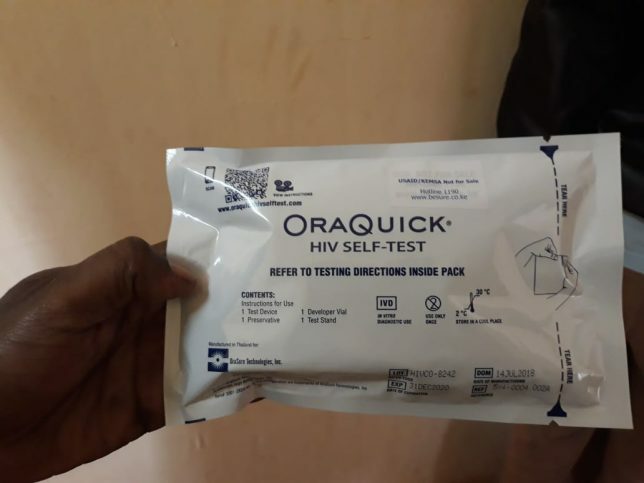 “They are the future of our country, and yet they’re not testing for HIV, and their HIV rates are going up.” He also gave every coach a free HIV Oraquick self-testing kit so they could test themselves in the privacy of their own homes, as well as free condoms and lots of free leaflets with information about HIV. The coaches presented Mr Guyo (left) with the list of questions they had discussed whilst in the classroom. Everyone was encouraged by the answers, and to know there were sufficient stocks of ARVs, condoms and tests available in Marsabit town. Not all areas have such great availability. 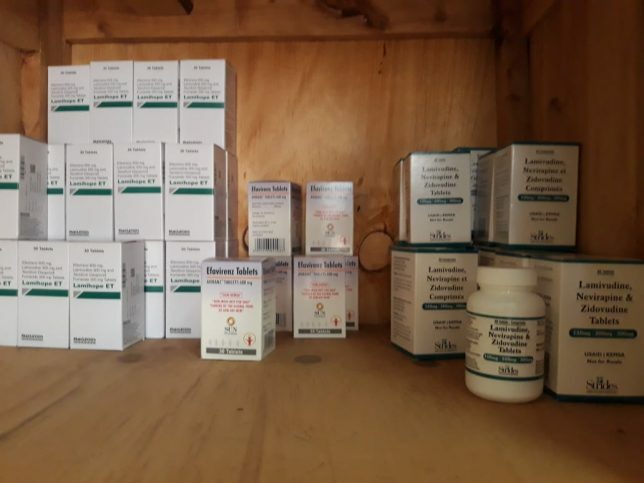 Coaches were particularly pleased to see well stocked medicine cabinets full of life-saving ARVs, and to hear that for children they provide ARV in syrup form. Pills are very hard to swallow for children. If you’d like to get involved in one of our famous fundraising football marathons, the 2019 registrations are now open! See https://tackleafrica.org/football-marathons/ for full details of where they are and how to enter. TackleAfrica is a company limited by guarantee (registered company number 07328452) and registered charity (registered charity number 1137931).